In the 1700s most of Vauxhall was marshland. People had to cross this land to get to church at St. Mary’s next to Lambeth Palace. This was a most dangerous route as there were robbers hiding in the marshes waiting to attack anyone crossing them. Naturally this made the people reluctant to cross the marshland to attend church. 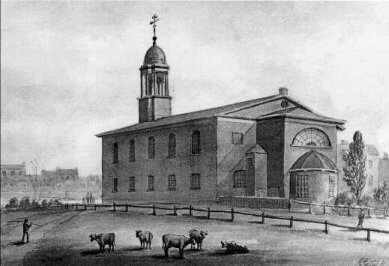 They petitioned for help and in 1793 a deed of settlement was drawn up giving permission for Lambeth Chapel to be built. The ground, upon which the Chapel was built, was leased from John and Sarah Bond, and Sarah Lindsey, widow, at a cost of £20 per annum. This lease was for 99 years and a management committee (including John Dollond, the optician) was formed to oversee the construction, furnishing etc., of the chapel. They decided to limit the total cost of the chapel to £3,000 and to raise this amount 60 x £50 shares were sold. Each share entitled the holder to four seats, the balance of the approximately 600 seats were let only to people the proprietors approved of, and there were no free seats for the poor. Six people were elected to a governing committee with the rectors £40pa salary being paid by the shareholders. South Lambeth chapel as originally built was apparently a rectangular building with a gallery round at least three sides of it. The holy table was at the west end. This was comparatively common at the time and the aim was that the minister, when celebrating, should face “the right way” (i.e. east) and yet be more easily audible to the congregation. During 1842/3 the cost of repairs to the fabric was £600. This, along with other problems and costs almost caused the closure of the chapel. The pew rents and collections were insufficient to maintain the chapel so a tax of £2-2s-6d (£2.13p) per annum was added to the pew rent. In November 1856, the chapel was partly burnt down. The fire might have been prophetic, for in the next month the first mention of establishing a separate parish in the district is found. It was thought that the chapel had served its purpose and must make way now for better arrangements. The district had undergone great changes. It was no longer a small, pretty hamlet but a part of South London, with established colonies of working class people occupying every inch of spare ground. It was suggested that the chapel be converted into a parish church. There is evidence of some form of sacrilege taken place at the chapel on 9 September 1857. Details of what happened are not known but Metropolitan Police Orders show that Inspector Proctor, in charge of V division, was due to make a report on the 11th and this was further followed up by V division police on the 15th. On 11 December 1860, a meeting was held to discuss the idea of becoming a separate parish further. Rev. H. R. Lloyd, vicar of St. Mark’s Kennington, was in the chair. The resolution was passed that the portion of St. Mark’s Kennington, known as South Lambeth should be formed into a separate district and the freehold of South Lambeth chapel should be secured with a view to consecrating it as the parish church. A committee was formed of several ministers and laymen among whom was Rev. W. Harrison who became the first vicar and Captain George Beaufoy, R.N. The cost of building the new church was estimated as “at least £1,500”. After considerable efforts to trace the current holders of the shares the site and the fabric of South Lambeth chapel was conveyed by deed to the ecclesiastical commissioners in 1868. Bishop Sumner, agreed to consecrate the chapel as the parish church of the new district on condition that the church was altered and enlarged. On 3rd February 1869, the church was consecrated in the name of St. Anne, mother of the Blessed Virgin (the dedication was chosen as a compliment to Anne Beaufoy). In June 1869 two boundary stones were laid to mark the limits of the parish, one at the end of Meadow Road, on the corner of the convent grounds, and the other on the pathway opposite the Oval cricket ground near Archbishop Tennison’s School. The first duty of Rev. Harrison was to carry out the alterations stated by the Bishop. The church had to be closed temporarily and services were held in the Eldon School, Wandsworth Road. First an entirely new east wall was built, altering the shape of the building and making room for the chancel and sanctuary, with the organ chamber on the one side and a choir vestry on the other, where the lady chapel is now. A new sacristy was also built. The tower over the organ chamber was completed as high as the belfry floor, and covered with a temporary roof which has remained there since. New entrances were made at the west end and a staircase was built to the only remaining gallery. The entire church was re-roofed and the whole transformation cost approximately £4,000. The original vicarage was also built at this time. The work was completed in 1876 to the designs of R. Parkinson and re-consecrated the same year. In 1898 the choir vestry was converted into the Lady Chapel by Mark Beaufoy as a memorial to his mother Anne. At the same time a new High Altar was dedicated by the Bishop of Rochester, also in memory of Anne Beaufoy and given by her daughter, Margaretta Cooke. A choir vestry was built on part of the vicarage garden. 1913-14 saw the extension of Brands Factory and gave the parish the opportunity of selling the old vicarage at a generous price. The vicarage moved to its present address in Fentiman Road. In 1917, a crucifix was unveiled at the east end of the church. In 1929 a window was dedicated to the memory of Mrs. Cooke, the Daughter of Mark Beaufoy and placed in the chapel. During the Second World War the church suffered major bomb damage but the vestments were rescued and temporarily stored in a railway arch in Miles Street. After the war the church was rebuilt, splitting it into two levels. The lower part became a large hall and the upper part became the church. 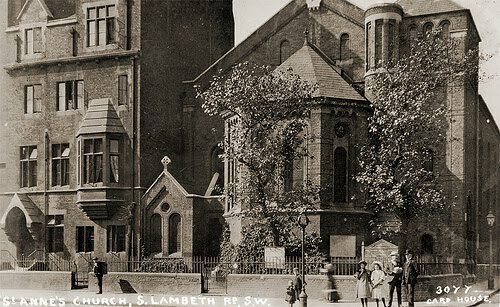 The neighbouring churches of All Saints (Devonshire Place, now Lansdowne Green Estate) and St Barnabas (Guildford Road) were both damaged during the war and it was decided that St Barnabas should become the parish church (renamed as All Saints and St Barnabas). During the late 1970s and early 1980s it became clear that the area could not support both the combined All Saints and St Barnabas Church and St Anne’s Church. After some protracted and difficult negotiations it was decided to sell the All Saints and St Barnabas Church (which was turned into an imaginative housing scheme) with the St Anne’s building becoming the combined church of St Anne & All Saints. The church suffered considerable damage when the BT Keybridge House was being built on the old Brands Factory site. When the builders were digging out the tower foundations the Church began to slip towards them. Large cracks formed in the Church walls, holes appeared in the hall floor and some of the stairs became unsafe. In fact the whole building required urgent repairs and redecoration but despite all the upheavals the church somehow was kept open and marriage ceremonies continued to be performed. The text for this topic is a summarised version of From Chapel to Church, A History of St Anne & All Saints Church, South Lambeth written by Brenda Fry for the Church’s bicentenary in 1993. Opposite Fentiman Road on the corner of Miles Street stands St. Anne’s Church. This took fire one wintry Sunday afternoon about the year 1854 (actually 1856) . All the resources of the fire brigade, the parish squirter and local firms were mastered together but to no avail. The fire raged on until at last the belfry fell with a loud crash scattering sparks in all directions giving an imposing effect against the leaden sky, the roof following quickly sending up a huge flame of fire lighting the neighbourhood for some distance, but like a defeated warrior with his last dying thrust, so the flames expired having done their worst. The River Effra and the Lake of Lawn contributed their utmost towards the extinction of the fire. The scene on the spot the following morning was worth a visit having been freezing hard for some days the icicles hung in very pretty and grotesque shapes from the remaining walls, etc.